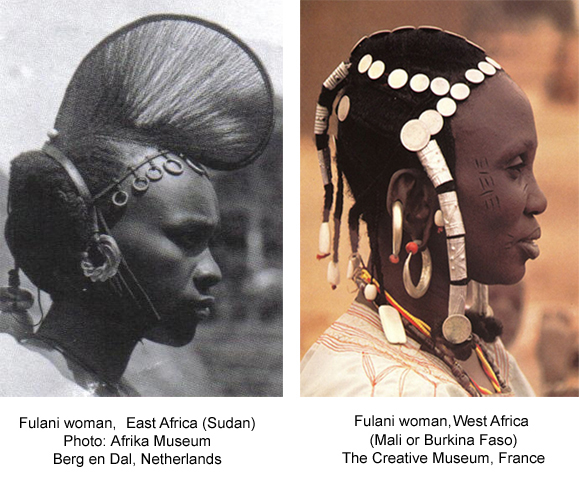 The complexity and symbolism of Fulani coiffures, hair ornaments, jewelry, clothing, and tatoos reflect their history as a conquering people. They have 4 castes: noblemen, merchants, blacksmiths, and slaves. Before the Europeans arrived, powerful empires ruled the African Savannah for over a thousand years. They were fueled by gold mines. In the 13th Century, the Empire of Mali (the Fulani people) conquered Ghana and created lavish royal courts. Timbuktu linked trade routes between the Arab lands in the North and tribal lands in the East and West. The result was a vibrant exchange of ideas, which made Mali a center of Islamic learning. As the Fulani spread Islam across Africa, they enfolded a vast array of tribes into their culture. Not only was religion important, but tribes expressed their identity, wealth, status, and fertility in physical and ornamental beauty. The Creative Museum has added some Fulani braid ornaments to their collection. The Creative Museum’s online exhibition on African combs, Facing Me, Facing You — and these books. 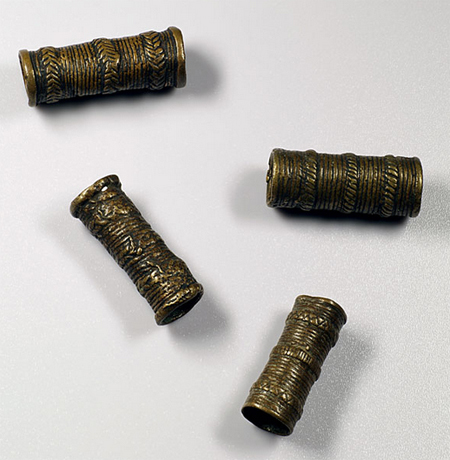 If you are inspired to wear some beautiful Fulani jewelry, I recommend the 24-carat-gold-plated seed pod earrings and cuff bracelet in the National Geographic store.